The Eagles didn’t manage to record a score in their final quarter against Adelaide in Round 12, notching up their first scoreless quarter at home in the club’s history. The Crows scored 41 points in the final term, so the score differential for the Eagles was -41. 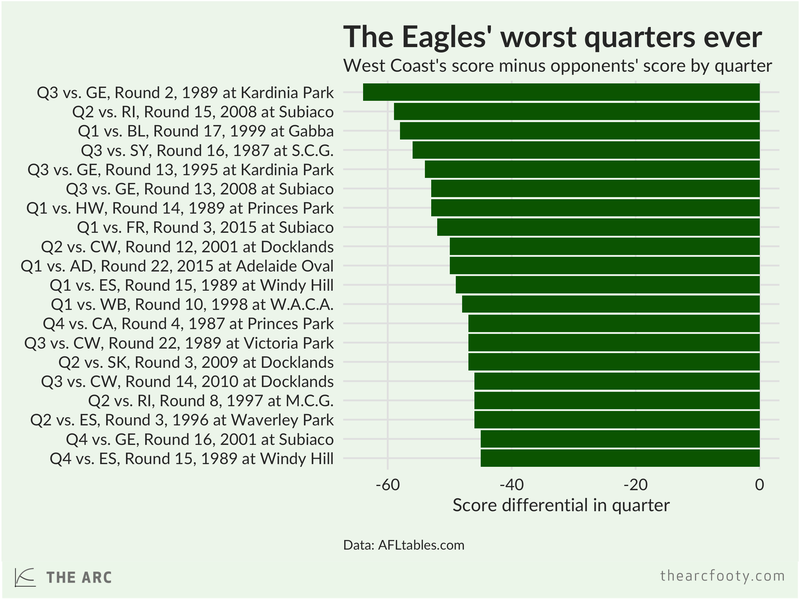 That doesn’t manage to crack the top 20 worst ever quarters for the Eagles, measured by score differential. Measured by score differential, the fourth quarter against the Crows was only the Eagles’ 37th worst quarter ever. There, Eagles fans, that’s not so bad! Although it was the eighth worst final quarter in the club’s history, but we won’t mention that.